Posted on January 14, 2016 by No Map Required Posted in Art, Art & Engineering, Engineering, Places, Spain	. For many folks, ourselves included, the first image we have of Barcelona is the Basilica Sagrada Familia. Having now been there, it SHOULD be the first thing because it is mind-blowingly awe-inspiring!!! 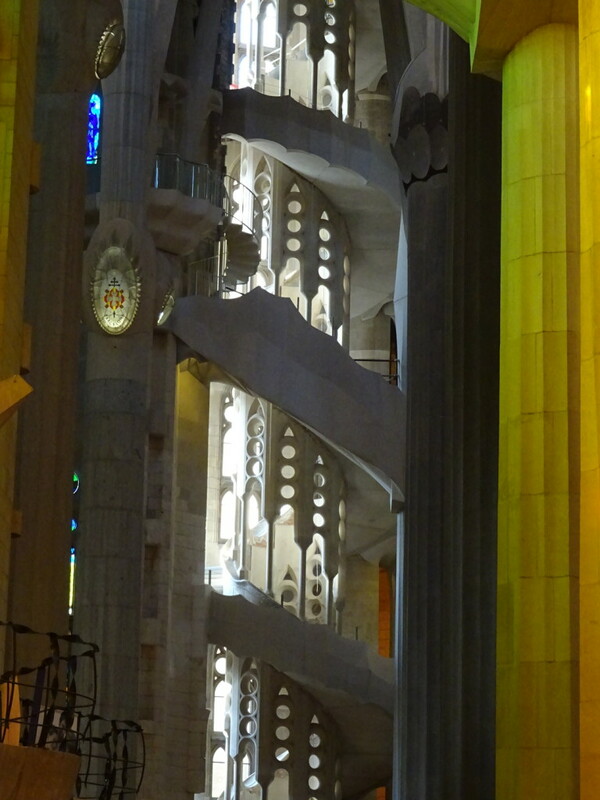 You know we’ve seen some unbelievable things on this trip, but the Sagrada is right there with the best of them! 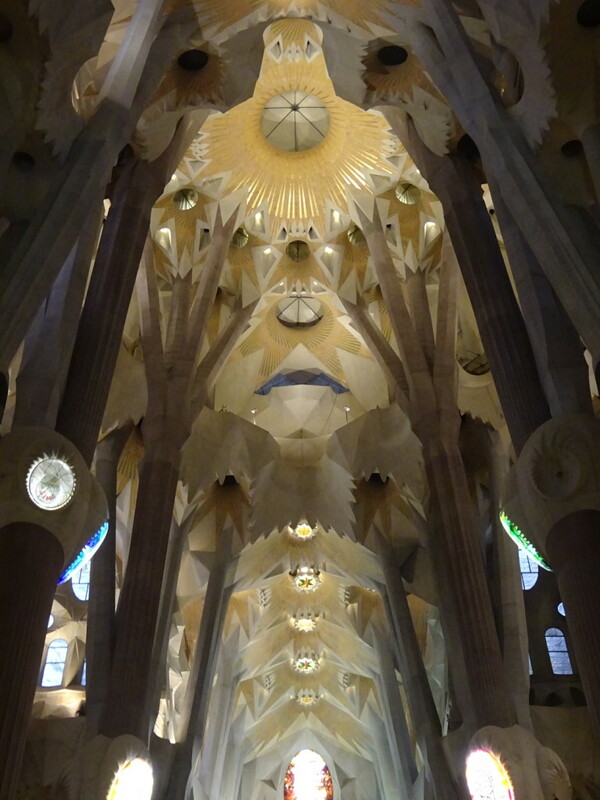 How to describe it…perhaps best to start with the architect himself, the visionary Antoni Gaudi. Books have been written, but here are two things to know: (1) His is name is pronounced GauDEEEEEEEEEE. (2) His work is unlike anything else on the planet. 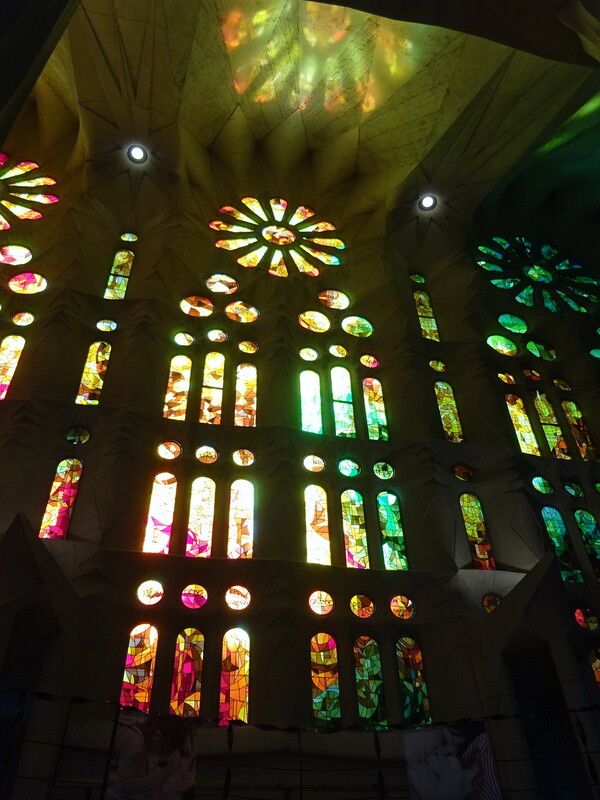 His designs mimic nature in ways in ways we’ve never seen before and his calling here on earth was to design the Sagrada Familia. 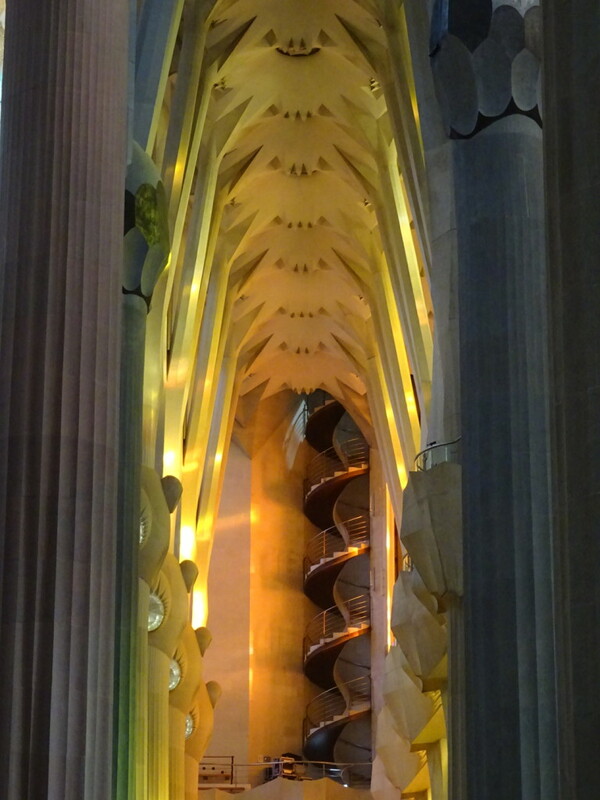 He designed quite a few other houses and buildings, which we’ll get to in our next blog, but for now, let us take you on an amateur tour of Gaudi’s masterpiece: The Sagrada Familia! Oops. 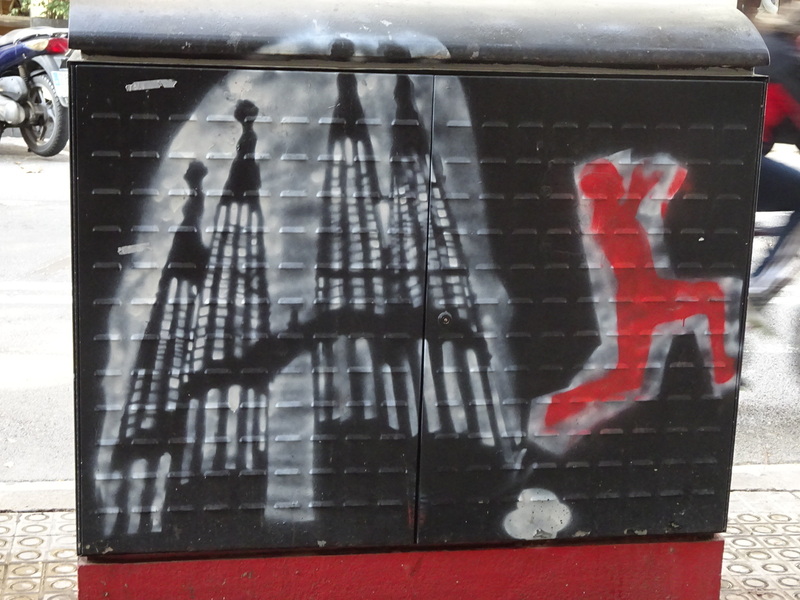 Well, while that IS the Sagrada, this should really go in Aaron’s upcoming Barcelona street art blog! Because apparently I live under a rock, I had never heard of Gaudi or the Sagrada until I saw 60 Minutes some time before we left on the big trip. If you missed it, here is a really good 13 minute description of Gaudeeeeee and the Sagrada. One warning, after watching it, you’re going to be adding it to your bucket list like we did! 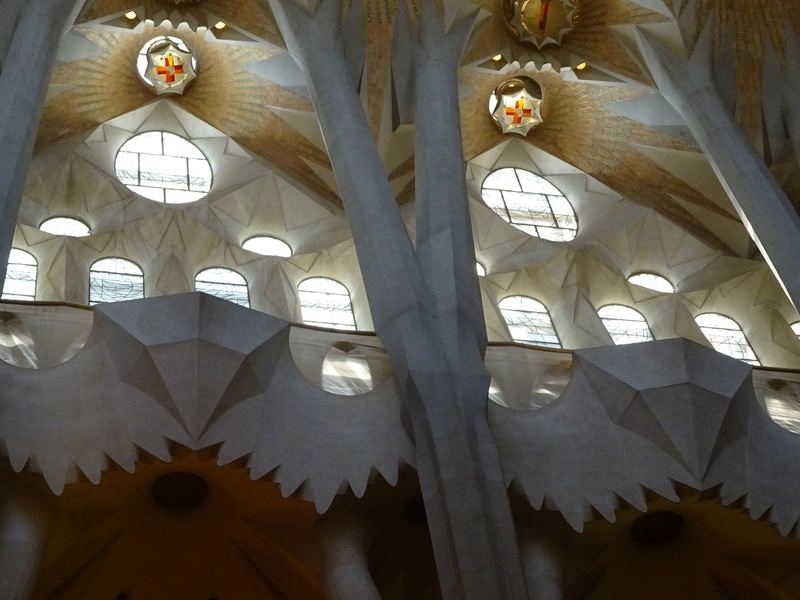 Assuming you skipped the video, let me explain that the Sagrada is a church. A basilica, actually, having been blessed by the pope in 2010. Now, we’ve all seen churches, but this one takes things waaaay beyond the traditional. Gaudi worked up this incredible design showcasing his visions of the divine, but knew that it wouldn’t be built in his lifetime. In fact, it couldn’t! The base could be started (in 1882), but then engineering methods had to catch up with his forward-thinking design! Knowing that, he made models of the church and left them for future generations to build from, but they were seriously damaged in a fire. Later painstakenly re-assembled, today a team of designers and engineers uses them as they work to finish the design to Gaudi’s specifications. The church has three sides: nativity, passion, and glory. He designed the first two sides (which are complete), but for the last one he basically left design criteria and it’s up to modern day architects to dream up. Kind of cool, right? 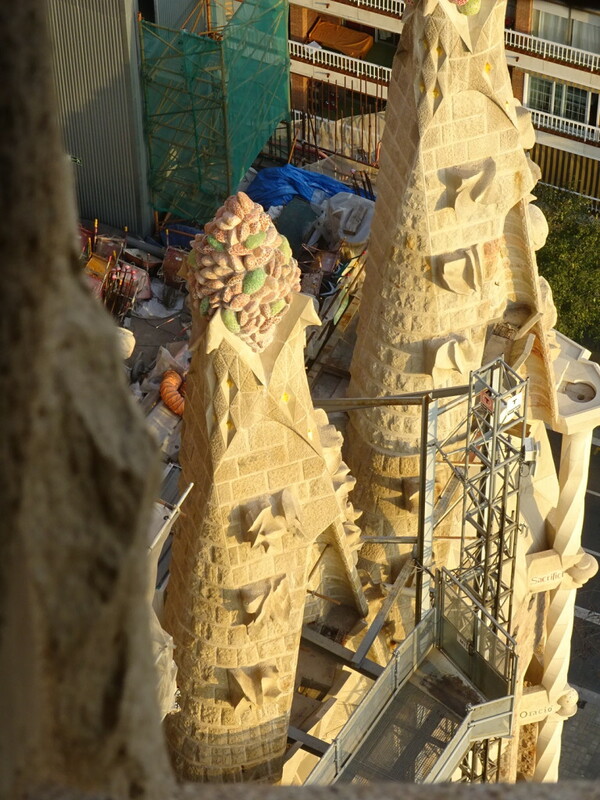 The Sagrada has been under construction for about 130 years with perhaps a decade left before completion. 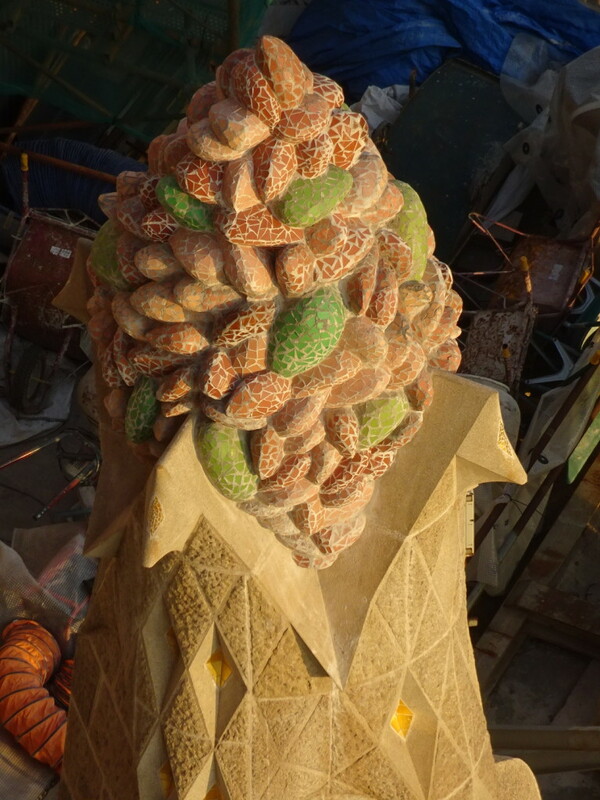 Not only have some people devoted their entire lives and careers to working on this one project, in some families generations have been devoted to the Sagrada. Talk about mega-projects! 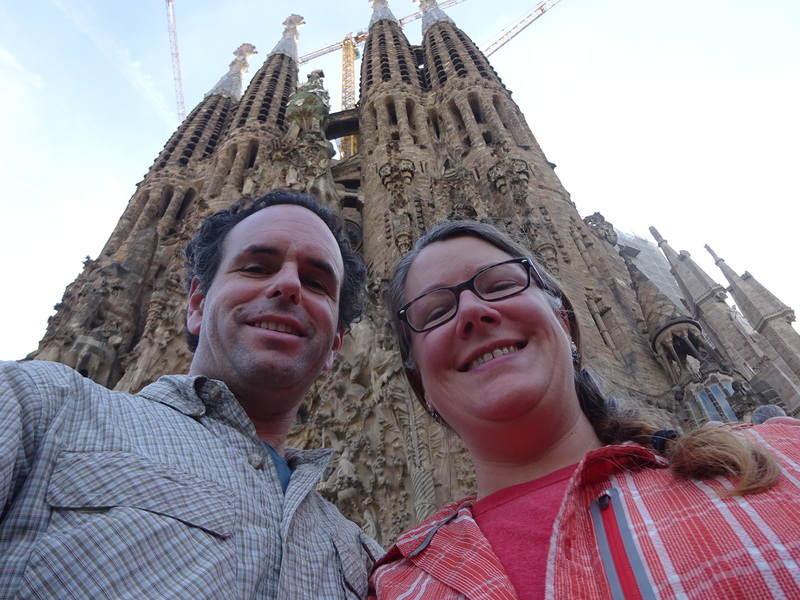 Our friends Ed and Brigit visited the Sagrada in 2004 and, seeing our photos while visiting us here in Lubrin, were stunned by how much it had changed! When they were there, the entire interior was scaffolding. Now, it’s a functioning tourist site and place of worship…though just wait for another 10-12 years to go by! Us in front of the Nativity side where it’s obvious this project is still under construction. 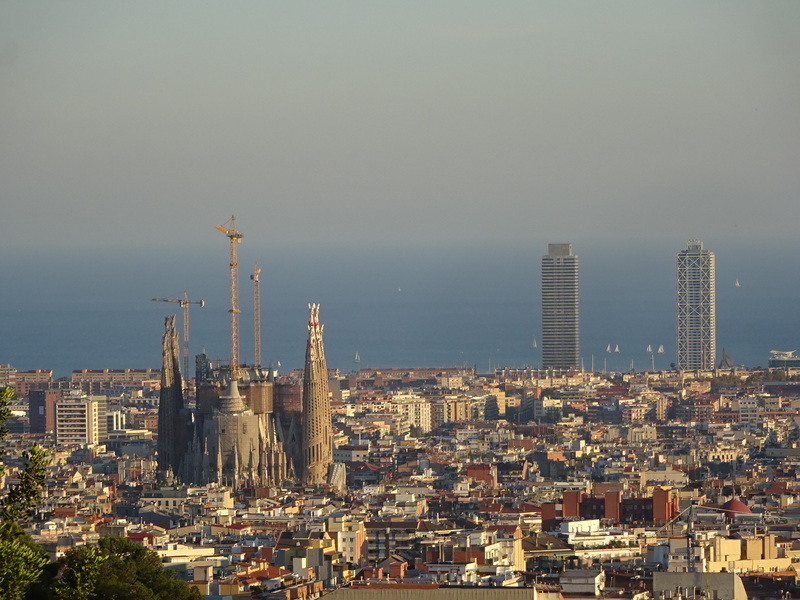 This really shows that the Sagrada towers over everything else in Barcelona as Gaudi intended. Now, ready to check it out? How about the outside first? Each side of the Sagrada is covered in bible stories with the nativity side focusing on, surprisingly enough, the nativity. 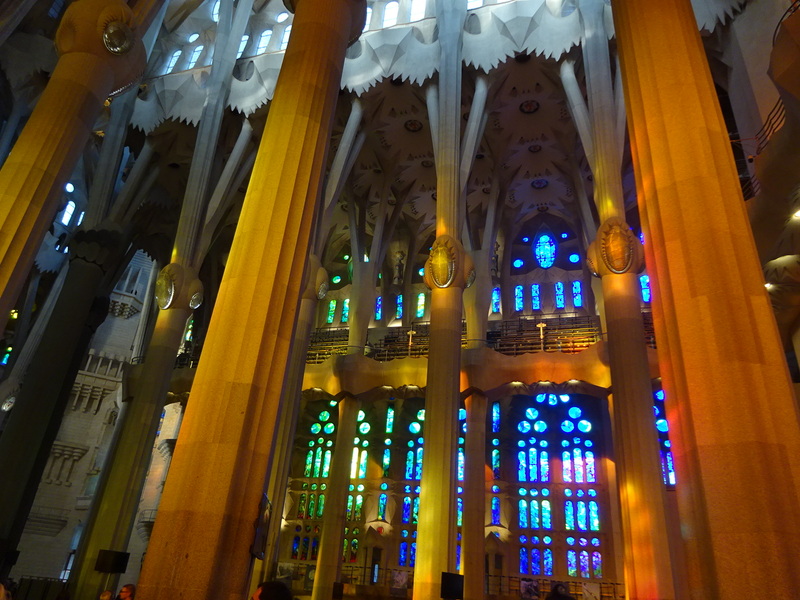 It is designed with a very flowy, classic feel but with Gaudi’s signature nature-inspired touches. Layers upon layers of carved designs and stained glass. There’s ALWAYS something more to see. He incorporated nature in every part of the design, so there’s this really fun element of snails, turtles, flowers, butterflies, and every sort of little critter in the sculptures. 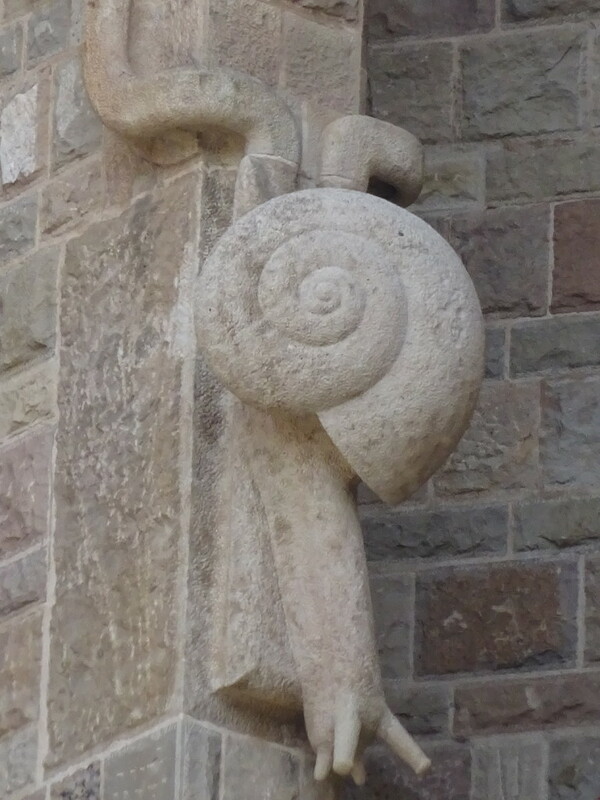 You don’t normally think of snails with churches, but “all of God’s creatures”, right? 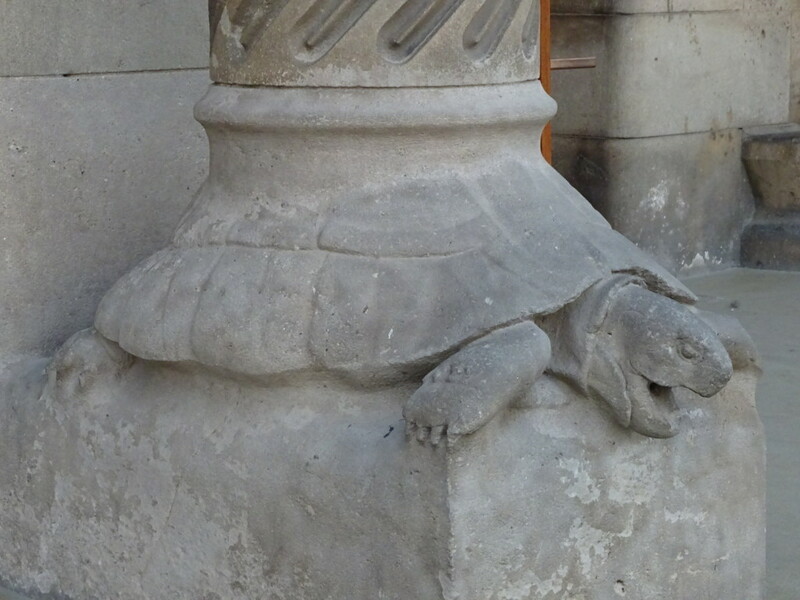 This turtle holds up the entire massive structure. Time to walk over to the other side of the basilica. Are you ready for something completely different? 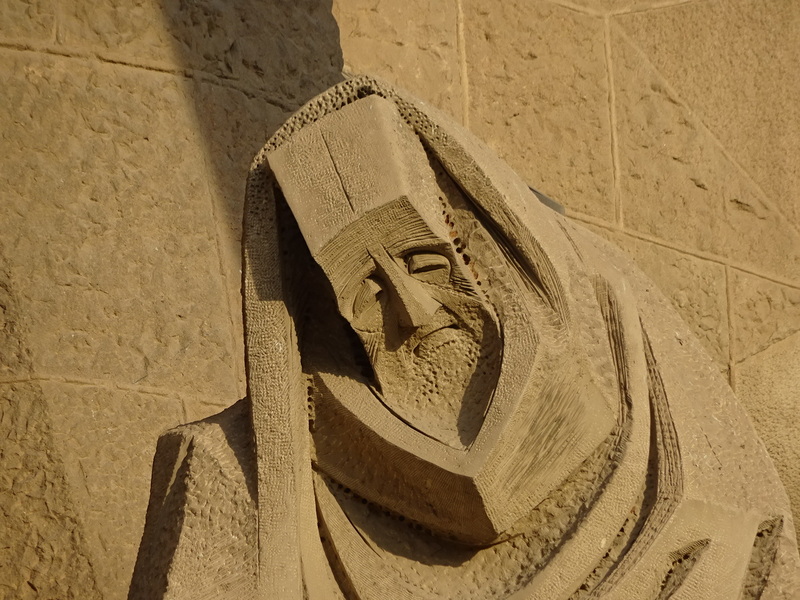 The artist Josep Maria Subarichs was brought in to create the sculptures on the passion side. Aaron loved his blocky, sobering style! Love the unique carving style. Such powerful expressions in such blocky creations! 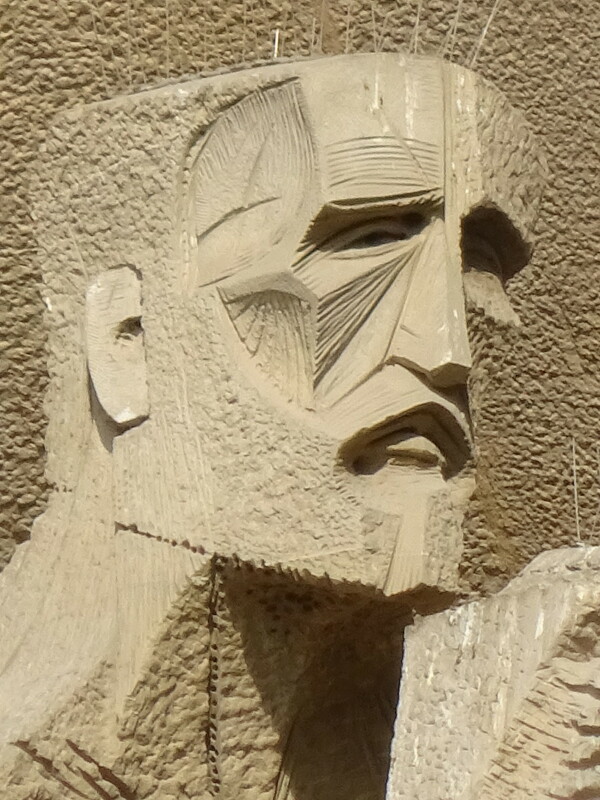 Even on church sculptures you have to add spikes on top to stop the pigeons from roosting. This was, if I remember right, actually modeled on Gaudi. Good to have him there as part of his creation. 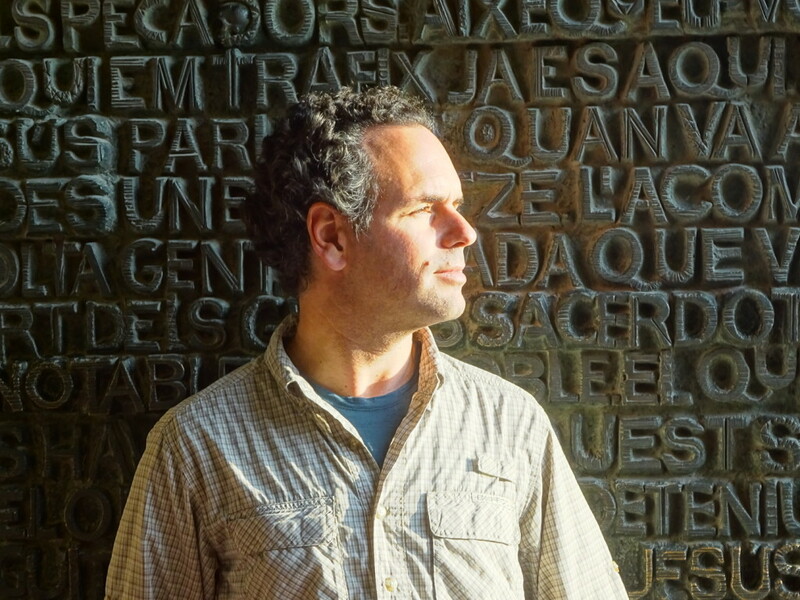 The giant brass entrance door is cast with Latin verses that looked like old typeset in the sunlight. Now, finally, it’s time to go inside. Our absolute favorite part of the Sagrada. Enjoy! Inside is difficult to explain so we’ll mostly leave it up to the photos. The columns are designed like trees with giant trunks and branches. 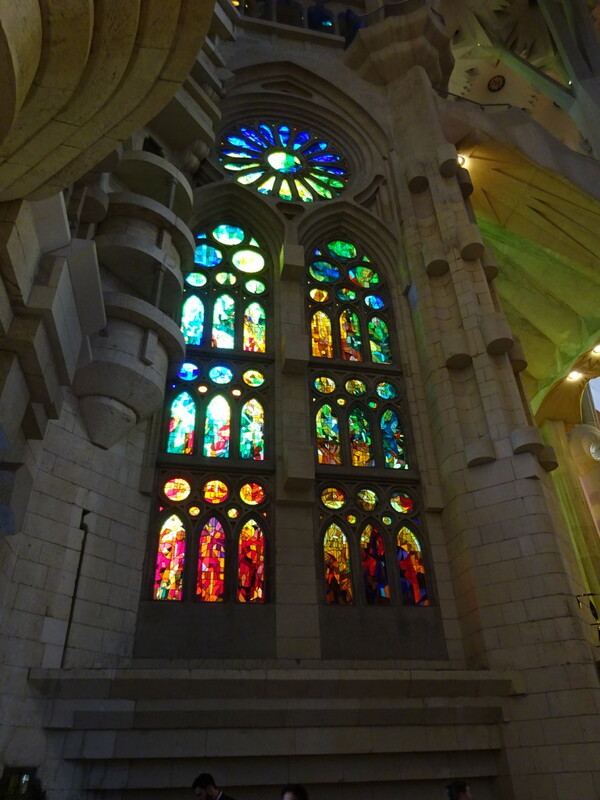 The light shines through the stained glass and colors the entire light-and-airy interior. 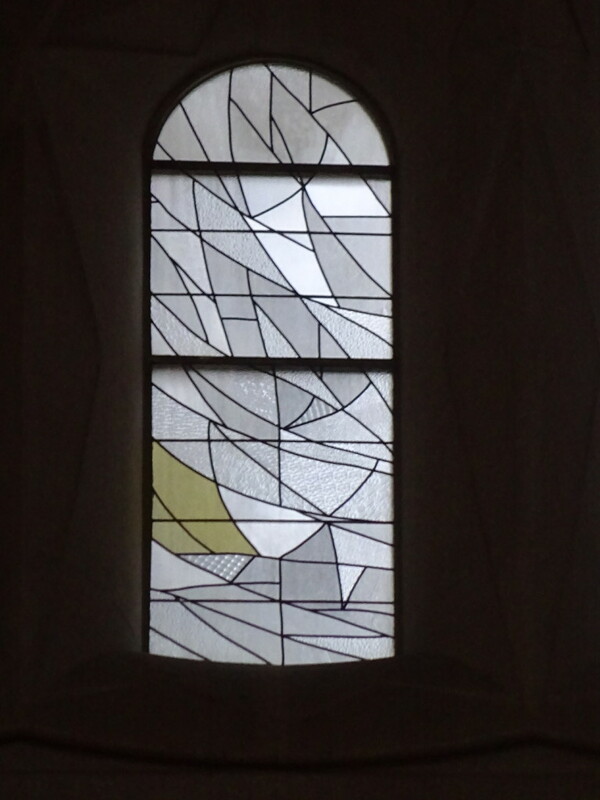 Not your typical stained glass. Upper balcony windows overlooking the tree-inspired columns with leaf/flower inspired sides. 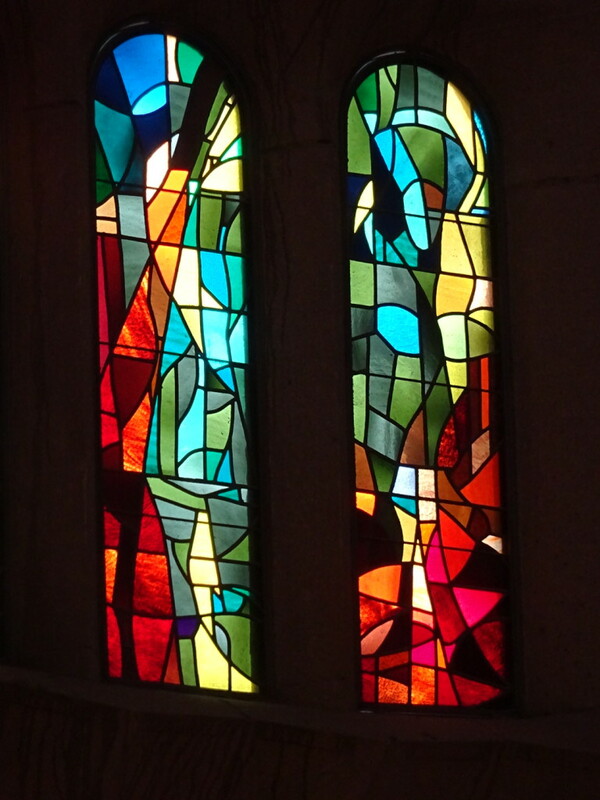 All those colors are natural light shining through the stained glass! Gobsmacking gorgeous! 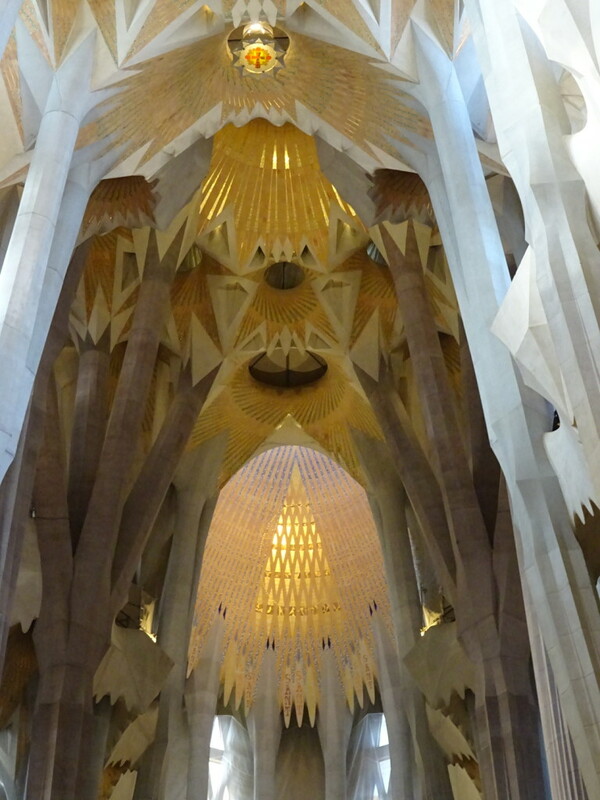 Gaudi truly designed based on knowing what the sun would do through the glass throughout the day. Those colors…it felt like we were on the set of a Broadway show! Here you can see how the columns split on the top a lot like tree branches. One staircase. We could totally feel the nautilus inspired curl. And another set of stairs, this one leading up to one of the towers we’ll describe below. Throngs of tourists even though it’s late in the day in low season. If you go in summer, you MUST get tickets in advance. 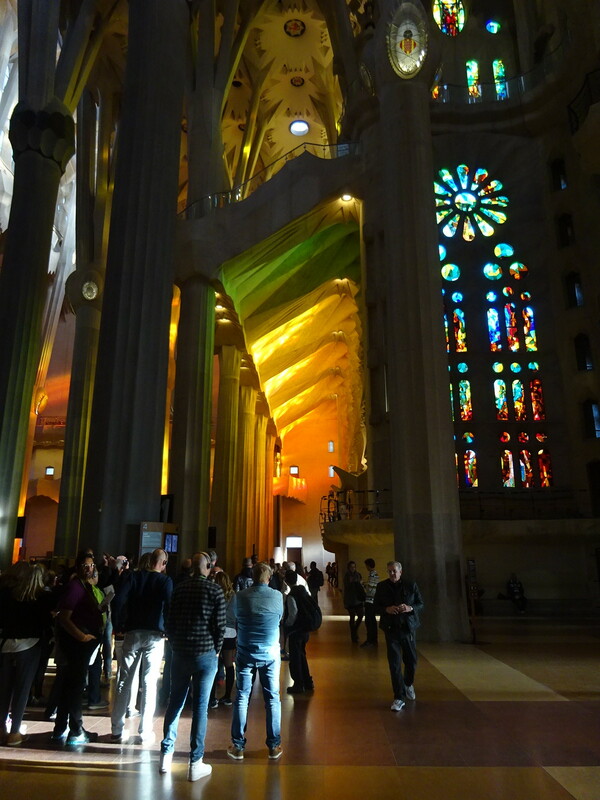 And try to go in the morning or late afternoon so the light really comes through the stained glass! Those colors…those reflections…what can I say??? He had such a sense of color. 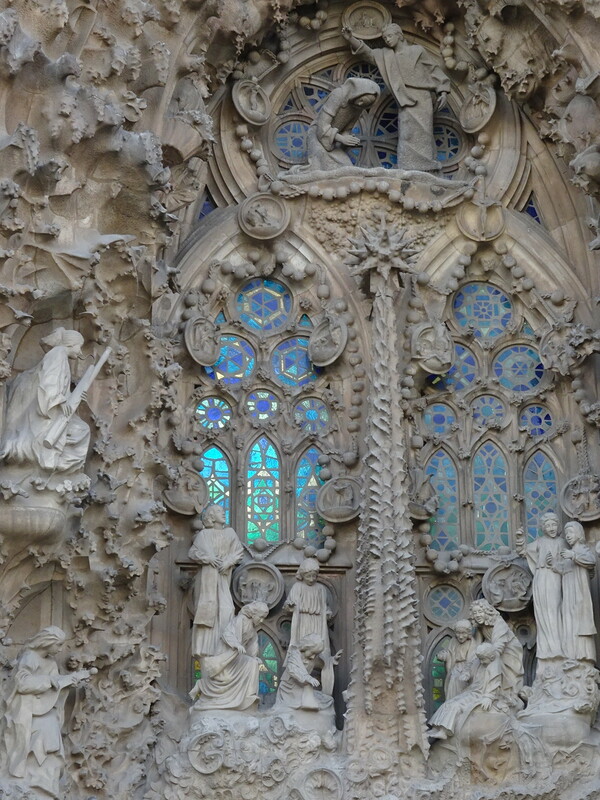 Yes, Gaudi designed every panel himself! We just couldn’t get enough of it! When you buy your tickets to the Sagrada, you have the option to also add on a ticket to go up in one of the towers rising from the church. Obviously we couldn’t miss a chance like that! 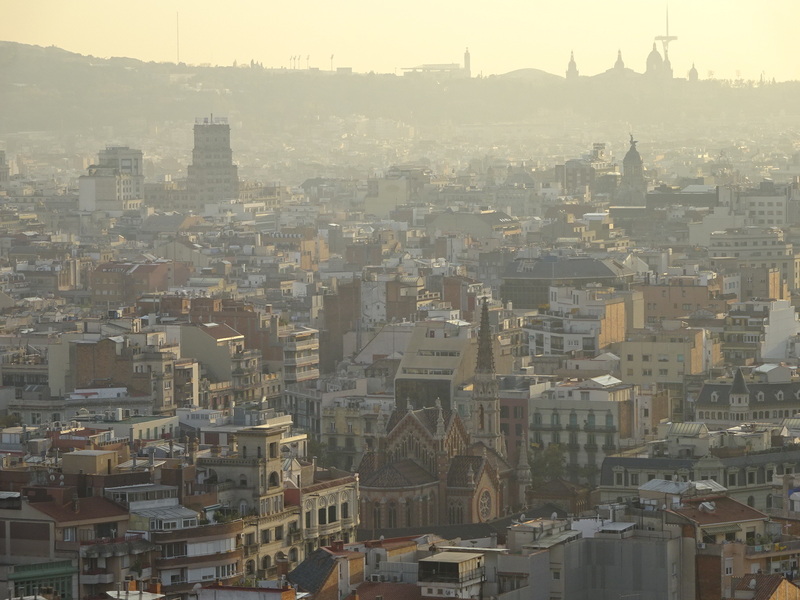 A way to see more of Gaudi’s masterpiece as well as huge views over the city? Yep, IN. There are two towers open to the public right now – we chose the Passion Tower as it has an elevator that takes you up and then you walk down a narrow (suuuuuper narrow) windy staircase. It’s not for the faint of heart or claustrophobic. The view from the tower lets you see the whole city and, more than that, you can see the other completed towers (still 4 to go!) and the ongoing construction from an entirely different vantage point. Not what you normally expect to see at the top of a church tower, eh? The view looking down gave us an appreciation for the ongoing construction. 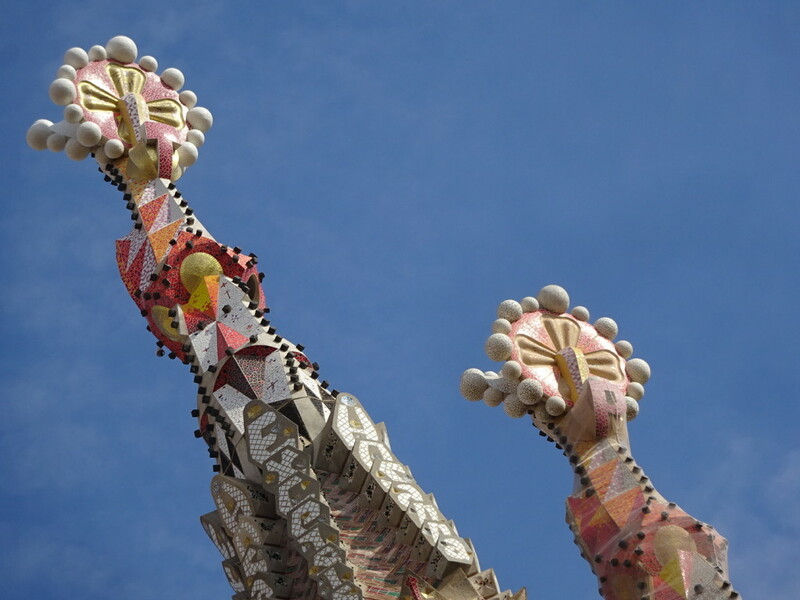 One of Gaudi’s signature styles: using broken porcelain as a mosaic sculptural element. Sometimes the mosaics look almost comical or clown-like in design, but truly they are so dramatic and so well thought out. That hole is an opening into the stairwell. The hazy view from on high. And there you go. The Sagrada was truly stunning – the 20,000 online reviews aren’t wrong! Collectively, this was our favorite stop in Barcelona. Aaron and I did the audio tour and Abby and Debby walked through at their own pace. Both ways were fantastic. 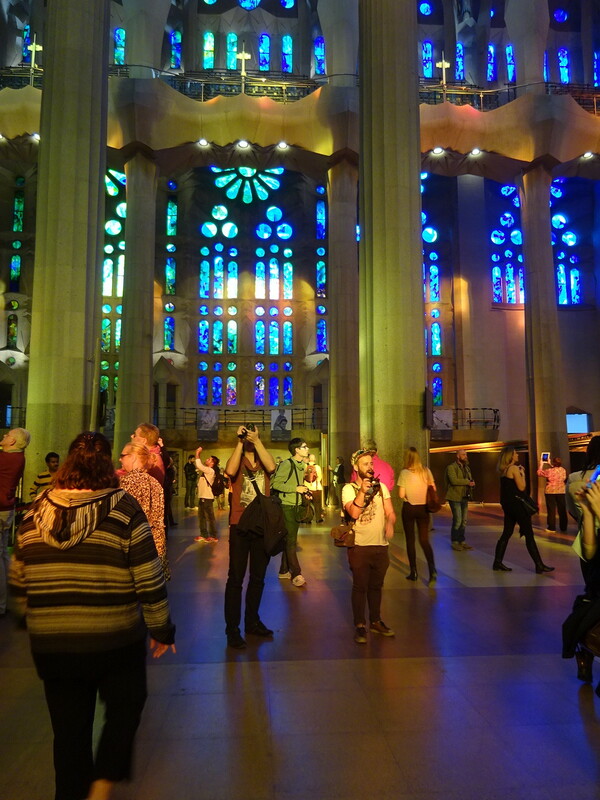 Something I was not prepared for was the museum below the Sagrada. That’s right, along with all this amazing architecture, there’s a museum underneath which shows how it all went from Gaudi’s drawings and models to actual modern-day engineering. I could have easily spent another day there, and definitely would have if the ticket was good for two days, but it’s pricy – so one day will do ya! Hopefully you now see why this was our absolute highlight in Spain. 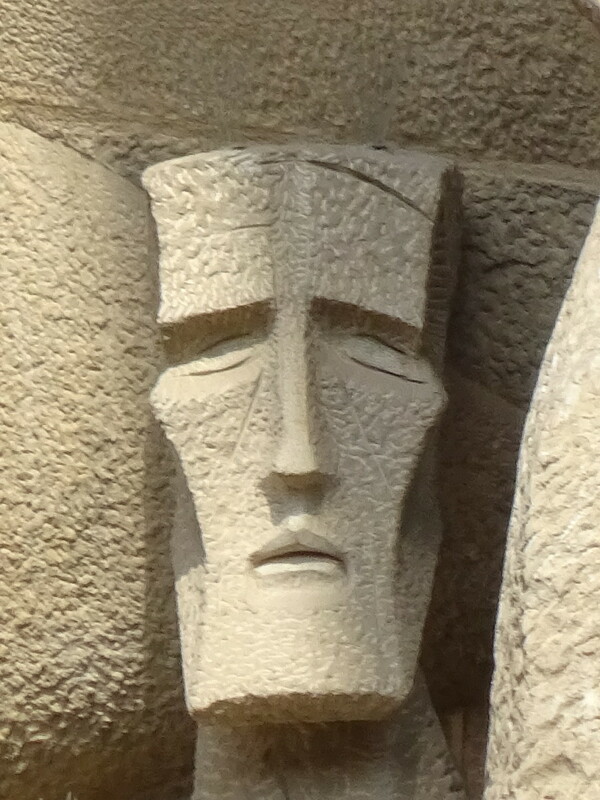 If we’ve sparked your curiosity, there’s much more information at www.sagradafamilia.org. Who wants to compare photos in 2030? 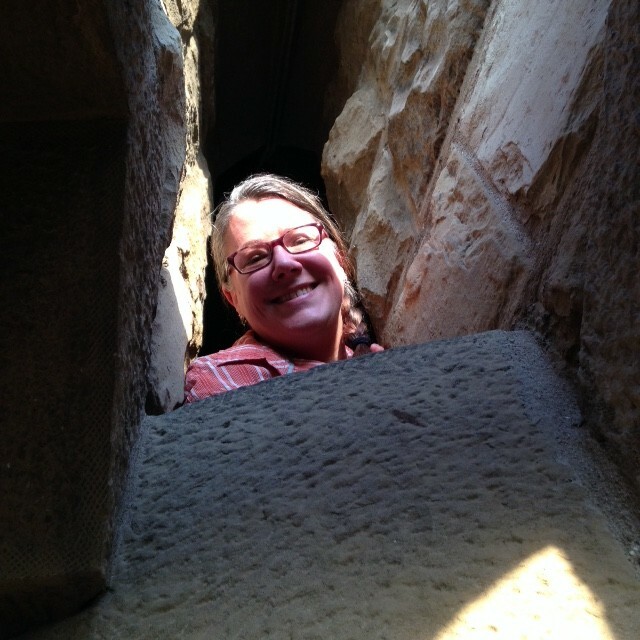 Saying Hi from the walk up the tower! Ok, I have to admit that, while never a big fan of Gaudi, I’m infatuated with this church and his designs. It does make me wonder if he were a deeply religious man or a man winking at the Catholic Church preferring nature over ritual. Anyway, thanks for all the photos. 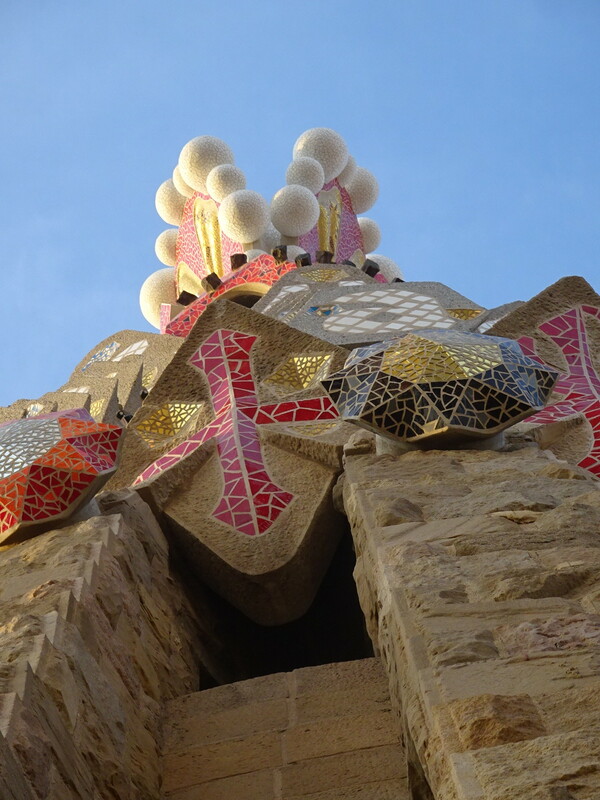 Gaudi’s way of combining nature and architecture really was inspired! Just wait for more on the next blog. Glad the blog didn’t take as long to build as the cathedral! How neat! I’ve never heard of him before! Just WAIT until you see the photos in our next blog! Gaudi is amazing.